Hi There! 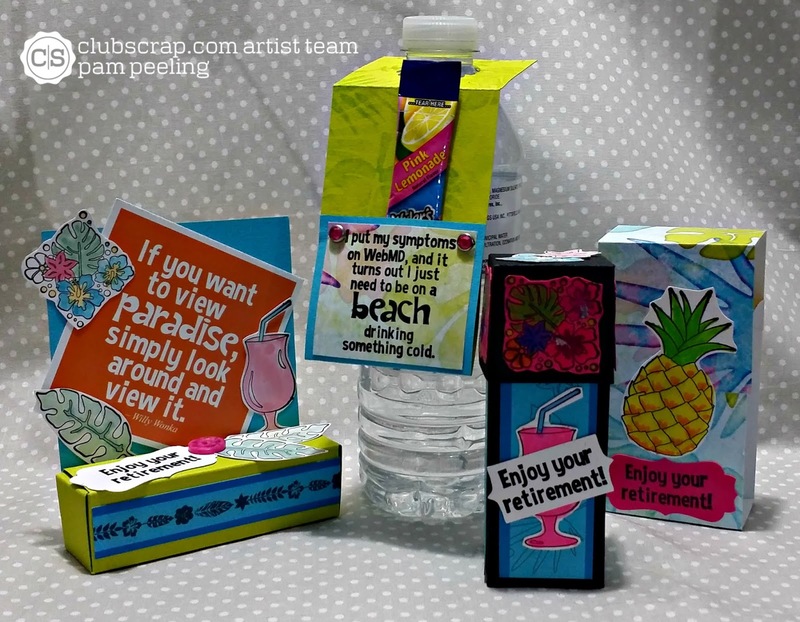 Welcome to the Club Scrap Paradise Blog Hop! You should have just come from Hetty's Blog along the hop. 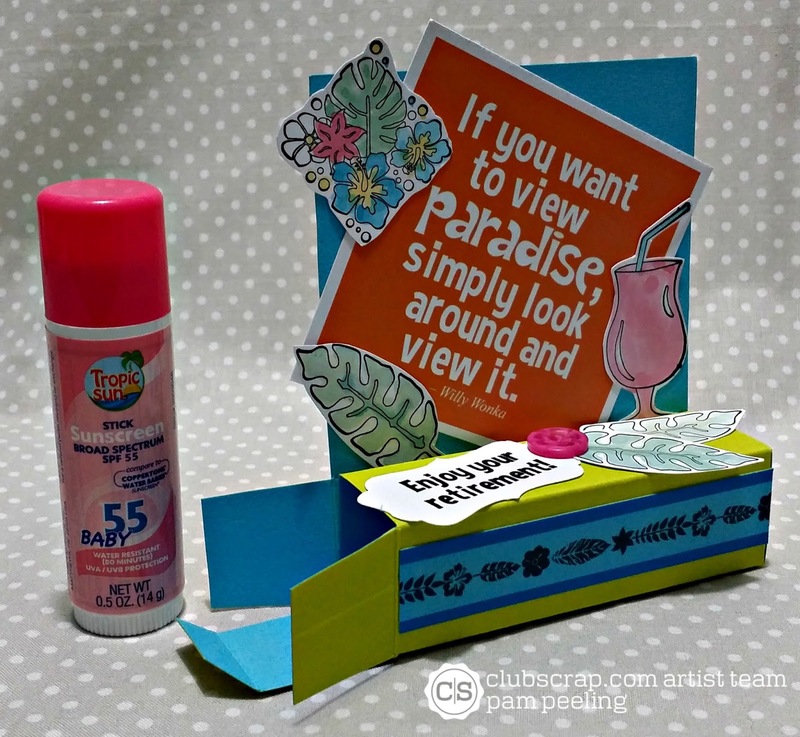 November's Paradise Kit is so fun with bright colors and tropical flowers. I decided to make a set of small gifties to give someone that is retiring. 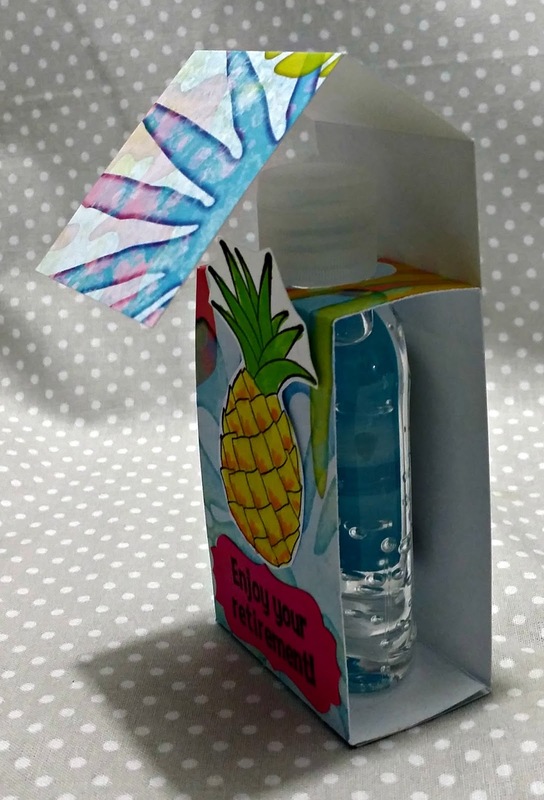 The set includes holders for lotion, hand sanitizer, sunscreen and a drink mix for bottled water. I found these little lotions in the samples section of Wal-Mart. 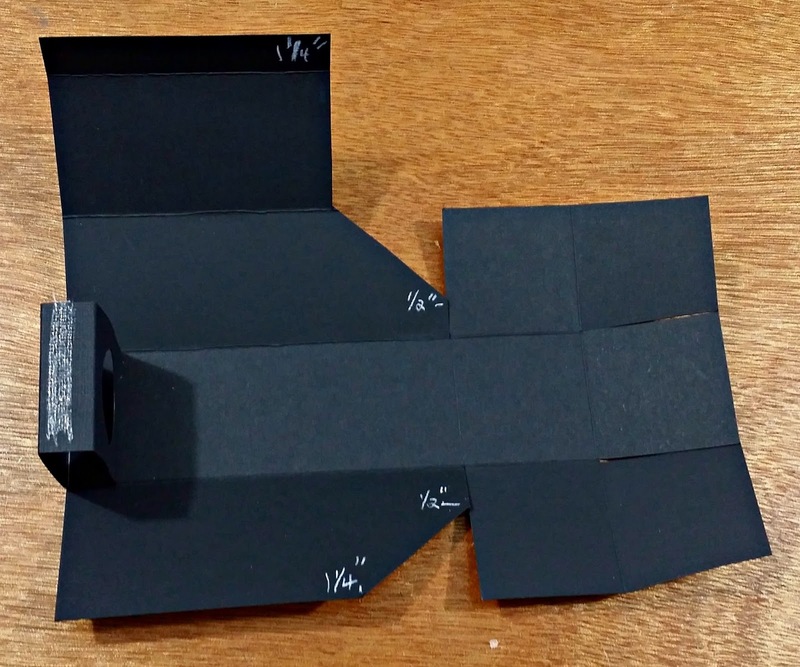 I designed the box around it's dimensions. You could alter the measurements for any size lotion. For the lotion box I cut a piece of cardstock 6 1/2" X 7 1/4"
I scored the 6 1/2" side at 1/2", 2", 3 1/2" and 5"
Score the 7 1/4" side at 4 1/4" and 5 3/4"
Cut the cardstock to look like this. 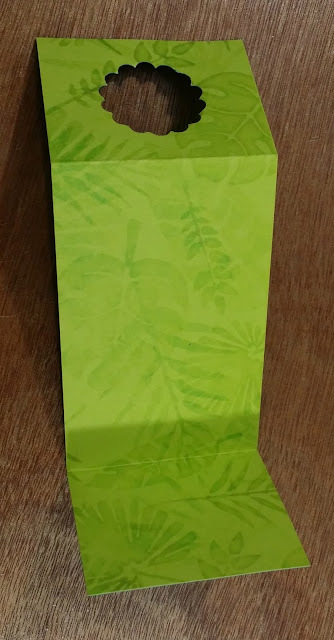 I cut the front of the box to show the lotion inside. 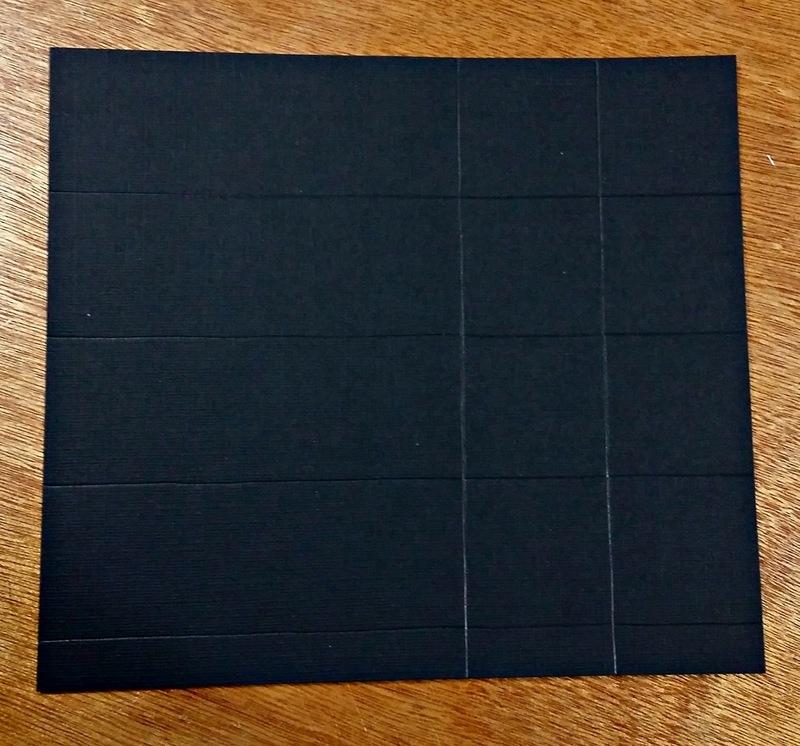 I've marked the cardstock with where to cut. Cut a piece of cardstock 1 1/2" X 4 1/2"
Score at 1/2", 2", 2 1/2" and 4"
Punch a 1" hole as shown. Attach the 1/2" ends together like shown. 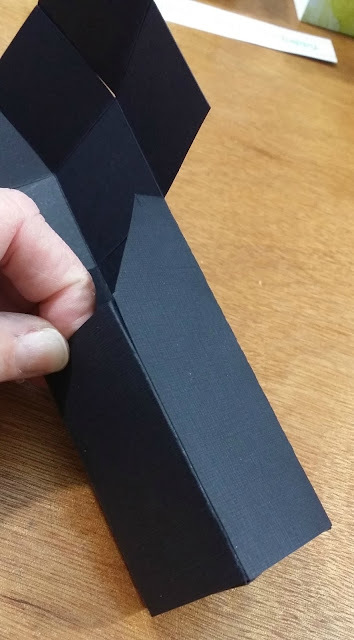 This piece will hold the lotion from rattling around the box too much. Attach the little bottom piece as shown. Put adhesive on the 1/2" flap and fold the sides over the bottom piece and attach. 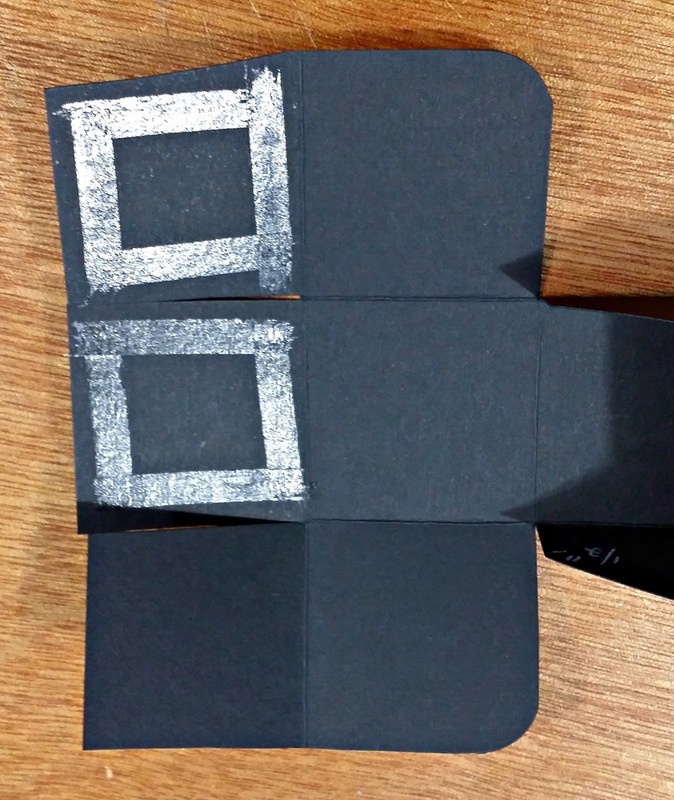 Put adhesive on 2 of the pieces of the cover and fold over each other forming a box like lid. 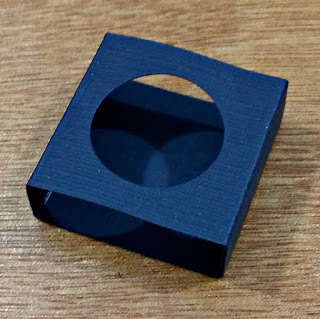 I used a corner punch to round the edges of the top-I just like the way it looks. The sunscreen box fits a small tube like the one above. Cut a piece of cardstock 7" x 9". Score on the short side at 1/2" and 1 /8" from each end. Score on the long side @ 1 1/8", 2 1/4", 3 3/8", 4 1/2" and 5 5/8". Cut as shown above. Fold up into a box as shown. 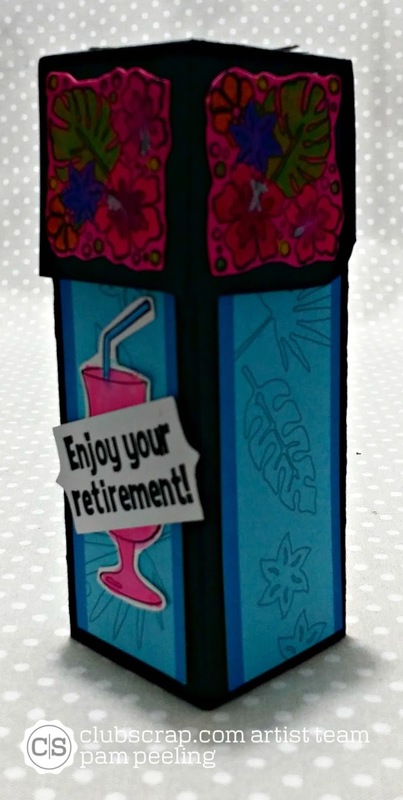 I used an aqua painter to color in the stamped images from the Paradise kit. There was a perfect sentiment with the unmounted rubber stamps from this kit! Cut a piece of cardstock 2 1/2" x 8 1/8". Score at 2" and 6". I punched a 1 1/4" scallop circle as shown. Fold the bottom piece up to form the little pocket for the drink mix. I used brads to adhere the pocket in place. For the hand sanitizer box cut a piece of cardstock 2 1/4" x 9". Score at 1 1/4", 5 5/8" and 6 7/8". 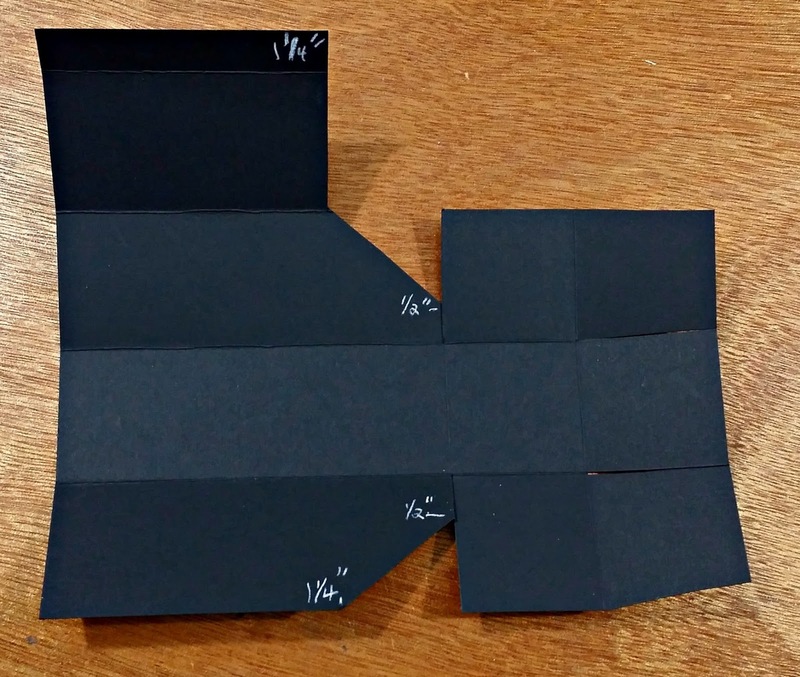 Cut another piece of cardstock 2 1/4" x 6 1/4" and score at 1 1/4", 4 1/2" and 5 3/4". Punch a 1" hole in the shorter piece as shown. 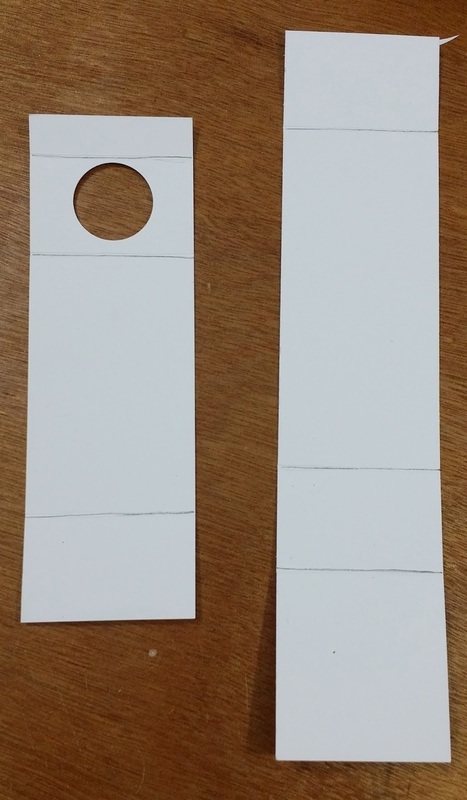 Attach the 2 pieces together on the 1 1/4" sections as shown. Put adhesive on the 1/2" scored part and attach the top part. 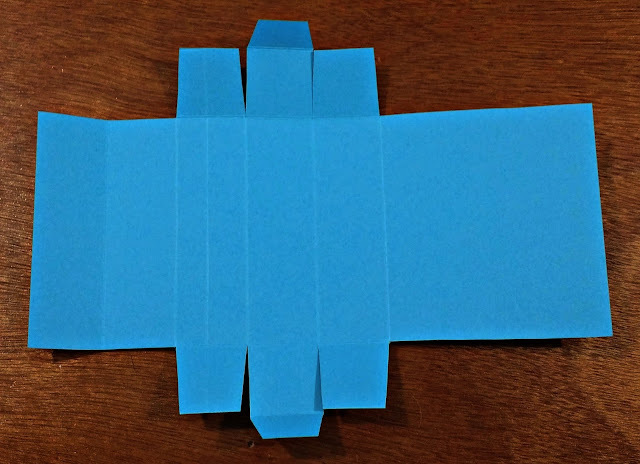 There's a little trick I learned to make sure the top part gets attached in the right place. 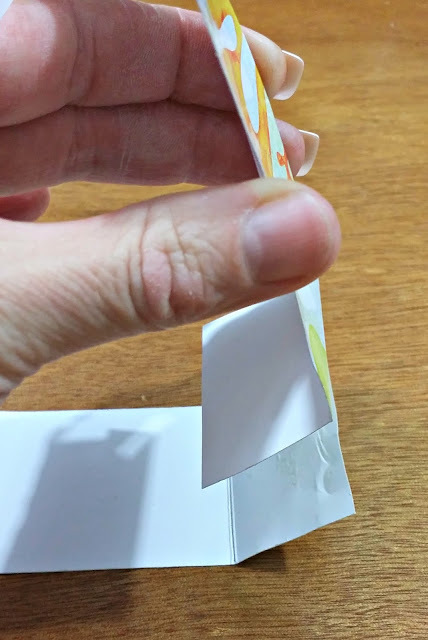 Fold the piece as shown and flatten the cardstock down-adhering the part in the exact position you need! Here's how the holder should look. 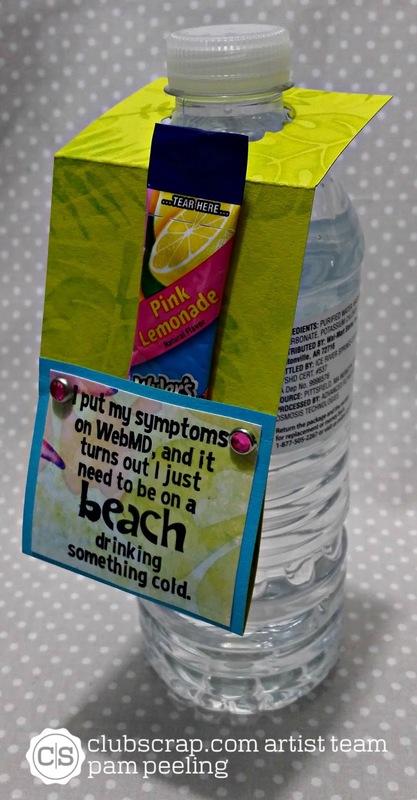 Decorate the front and slip in the hand sanitizer! Done! 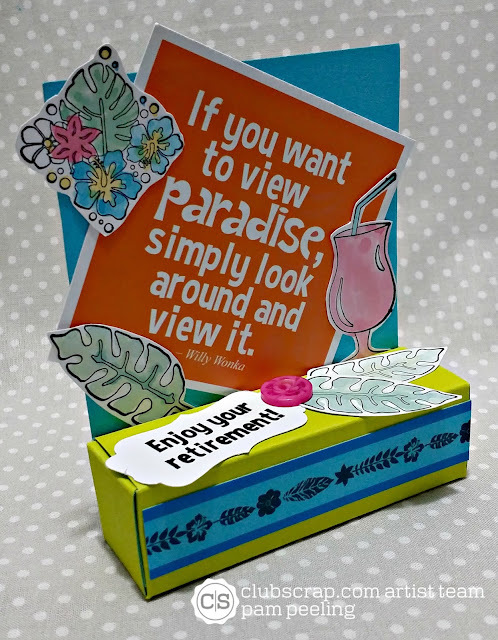 Next on the hop is Tricia-check out what awesome thing she's done with the Paradise kit! WOW Pam. So many cool ideas. I especially like the lip balm holder. Would be great for Christmas gifts. Your friend must have loved these cool gifts! WOW Pam, these little goodies are all so fun to look at, and are useful gifts too! Thanks for all the detailed instructions. Brilliant inspiration for little gifties at any time of the year for adults and kids alike. Thank you for sharing and definitely casing this. Pam...you are so clever! 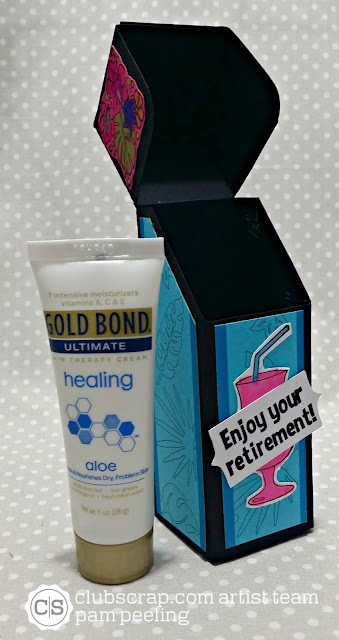 What a great way to present these little goodies! 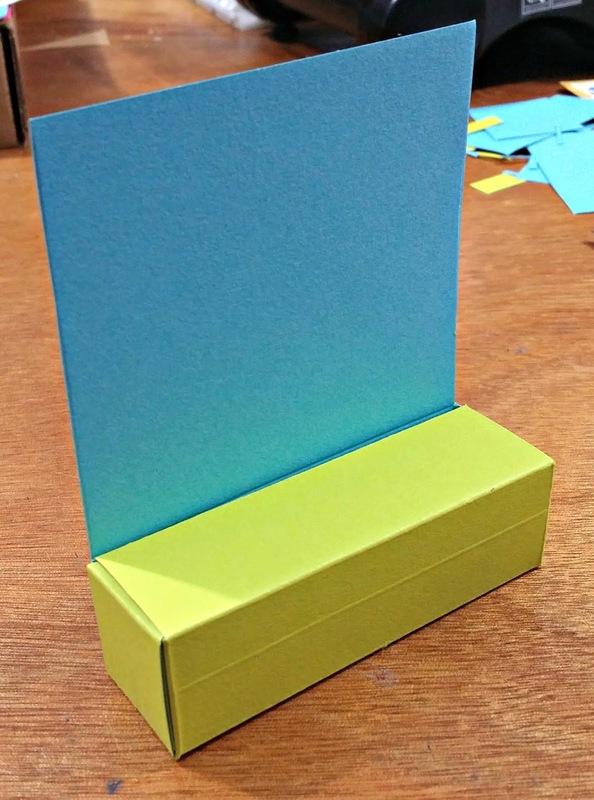 These are great little boxes for odd shaped items. Must keep this in mind for Christmas! Adorable and creative way to wrap small gifts. Thanks for the ideas. Have a great day Pam. How stink'n CUTE these all are! Love the gift boxes too! beautiful job using this months Paradise kit! Pam, you muct have been busy all month! What a lot of great gift ideas. Thanks for the awesome tutorials on how to make each individual gift item. So very cool! Terrific packaging ideas. The picture are really helpful - thanks for all the ideas! 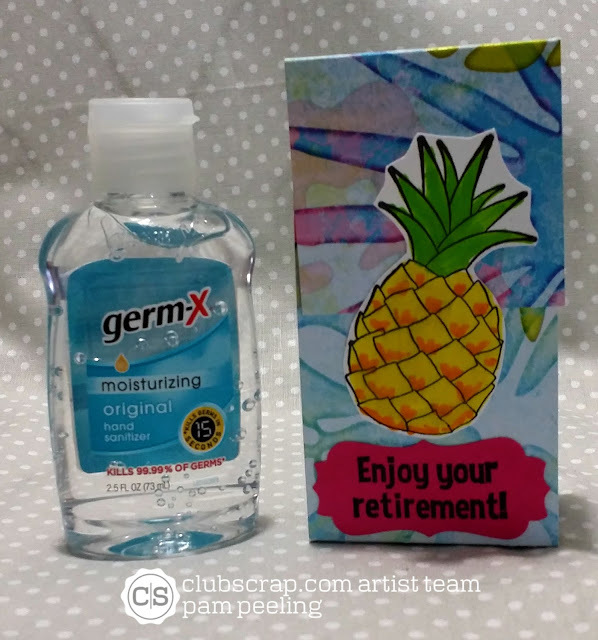 Wow, you use the stamped and printed quotes so well with the gifts, so fun, and all those box folds are so great, just an awesome bunch of projects!!! Love these gift ideas!!!! Awesome! Love all the decorative boxes!